Impact met the need for the dissemination of information to multiple recipients through an Intranet portal, a commonly accepted communication tool in different languages to serve 35 countries and with the ability to perform a custom search. 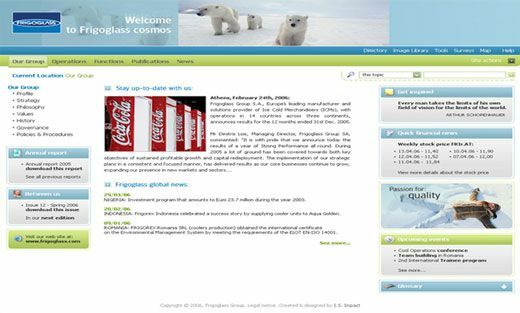 On behalf of the Frigoglass Group, an international organization which is based in Greece and has its presence in Europe, Asia, Africa and Oceania, we managed to organize and structure all of the corporate data of all its companies, existing factory divisions and all individual workers in Greece and abroad, developing a common corporate culture, improving internal communication and cooperation between them. WANT TO ORGANIZE YOUR BUSINESS’ PROCESSES?